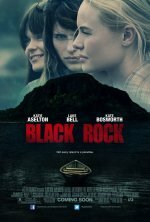 Black Rock Movie Not every island is a paradise. The film chronicles three childhood friends who embark on a weekend getaway to the isolated island of Black Rock, only to discover that they are not alone. Black Rock release date was Friday, May 17, 2013. This was a Limited in theaters release. Follows three female friends who set aside their personal issues and organize a girls getaway weekend on a remote island on the coast of Maine. One wrong move turns into another as there is a deadly fight for survival. Described as a mix between Deliverance and Thelma and Louise. added the tagline: "Not every island is a paradise."